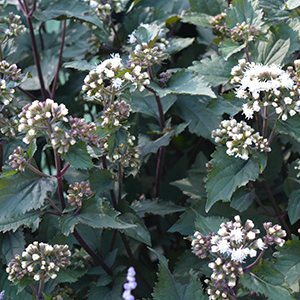 Grown to the foliage as well as the flowers, Ageratina altissima Chocolate (syn. Eupatorium rugosum ‘Chocolate’) is a perennial plant from North America. It is the new Chocolate coloured foliage that sets it apart, although we would call it more of a green bronze as it ages. White flowers rise above the foliage in autumn, appearing in fluffy white clusters they contrast against the foliage. This is a plant that has a number of uses in the garden, once established it grows well in dry shady areas as well as in sun. In flower, Eupatorium rugosum ‘Chocolate’ will attract bees to the garden, and both the flowers and foliage can be cut and used in vases. This is a clump forming plant and the best way to propagate it is by dividing more established plants in late winter to early spring. Eupatorium rugosum ‘Chocolate’ is easy care, it is best in a humus rich well drained soil, although this is an adaptable plant. It is fairly undemanding in terms of soil, as long as it is well drained. After the initial planting you will need to water well through the first summer. If you are planting Ageratina altissima Chocolate beneath trees, we suggest improving the soil a little first. Some additional watering as the soil drys until the plant is established will also be befeficial. This is a herbaceous perennial, it will die right back in winter to reshoot from the base in spring. Some gardeners like to prune the plant back in late spring to summer to control size and create a more bushy habit.